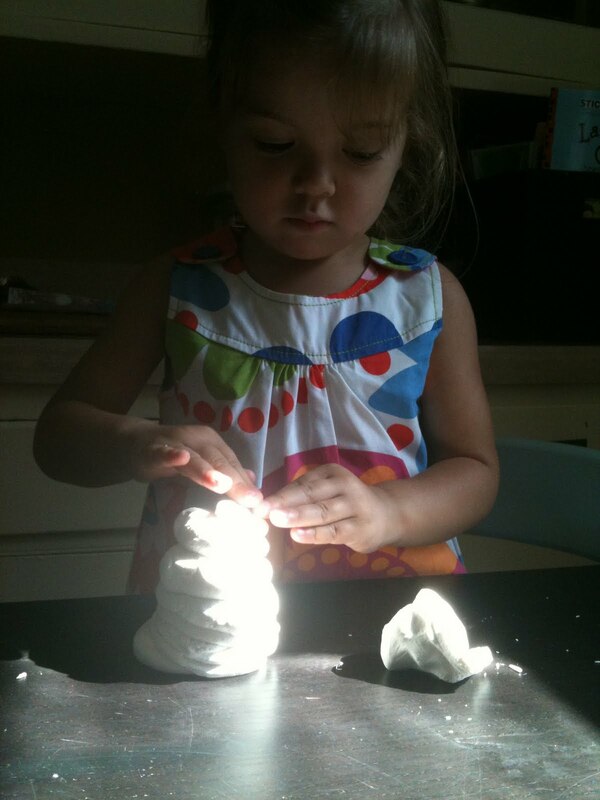 If you have never used Model Magic it is a lot like a moon dough or play dough. Very soft and easy for young kids to manipulate. A few weeks ago we made Model Magic sculptures. I started by showing the Bee how you can pinch and push to make different shapes and textures and then just let her go. She made a very cool sculpture that sort of reminded me of a tower of rocks. The model magic never fully dries out but after a while it does form a hard crust and at that point you can either color the surface with marker or paint it. We opted for the painting and used watercolors which work great with the model magic! It actually does dry out. it took 2 weeks, with one of those weeks on a radiator!